Cure: Treat work assignments as Projects, with a Spec, a Schedule, and a Budget, and get these things straight before expending any effort in the workplace. Why it Works: In school, there is a direct relationship to the effort you put in (studying, reading, taking good notes, attending class, etc.) and the outcome you get (good grades). And every class you take contributes to your GPA -- in other words, every class you take is equally important in terms of your GPA. And your GPA is your primary performance metric at school. So it follows that you should do everything as accurately and precisely as you can in order to do as well as possible. But this is not true in the world of work. In the workplace, the assignments are often vague, the success criteria are not precisely defined, and you are not going to be given a letter grade for your work. All you can hope for is sporadic feedback from your boss and your peers, a performance review on a periodic basis, and (hopefully) nice raises along the way. Spec, Schedule, Budget always compete. It might be more important to get the project done fast (an hour, a day, whatever) than to get it done cheaply or well, so that Schedule is the most important thing. Or maybe, meeting the precise letter of the Spec is the most important thing. This is most similar to the classroom environment. But such situations are rare in the workplace -- most specs have some room for negotiation, especially if a different spec can save money or time. Sometimes the Budget is the key thing, because if a budget is exceeded then a new round of approvals need to be asked for and granted, and nobody wants to ask for such approval. Whenever you are given an assignment, you should always ask questions to clarify what is being asked. In other words, you need to define your project. The first question you should ask is about Schedule -- "When do you need it?" Getting the time frame right makes it much easier to frame, negotiate, and document the rest of the assignment. 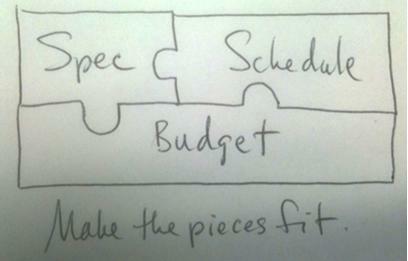 The next question is some variant of "Please rank these factors in order of importance -- Spec, Budget, and Schedule". This question will generate good discussion about what is really being asked, what else is going on with the project, any sensitive issues that might not have been mentioned before, and so on. And don't take "All of them" for an answer -- that sort of thinking leads to lame projects that sap everybody's energy. After this, be sure to document your understanding in a concise email, and ask for validation that you have gotten it right. Do you promise to approach your work assignments like Projects from now on? Then tell your friends! Like, Share, Tweet, or Email below!